There is substantial interest in the possibility that cognitive skills can be improved by dedicated behavioral training. Yet despite the large amount of work being conducted in this domain, there is not an explicit and widely agreed upon consensus around the best methodological practices. This document seeks to fill this gap. We start from the perspective that there are many types of studies that are important in this domain—e.g., feasibility, mechanistic, efficacy, and effectiveness. These studies have fundamentally different goals, and, as such, the best-practice methods to meet those goals will also differ. We thus make suggestions in topics ranging from the design and implementation of control groups, to reporting of results, to dissemination and communication, taking the perspective that the best practices are not necessarily uniform across all study types. We also explicitly recognize and discuss the fact that there are methodological issues around which we currently lack the theoretical and/or empirical foundation to determine best practices (e.g., as pertains to assessing participant expectations). For these, we suggest important routes forward, including greater interdisciplinary collaboration with individuals from domains that face related concerns. Our hope is that these recommendations will greatly increase the rate at which science in this domain advances. National Science Foundation (DRL-1641280) to Dr C. Shawn Green; Office of Naval Research grant to Dr. Daphne Bavelier. The following authors have declared conflict(s) of interest. Bavelier is a founding partner and on the scientific advisory board of Akili Interactive, Boston; Vinogradov is a consultant for Posit Science Corp, Alkermes, Inc., and Mindstrong, Inc.; Ball owns stock in the Visual Awareness Research Group (formerly Visual Awareness, Inc.) and Posit Science, Inc., the companies that market the Useful Field of View Test and speed of processing training software (now the Double Decision exercise in BrainHQ), and is a member of the Posit Science Scientific Advisory Board; Gazzaley is a co-founder, scientific advisor, and BOD member for Akili Interactive Lab and has several patents filed at UCSF for video game enhancement technologies; Jaeggi has an indirect financial interest in the MIND Research Institute, Irvine, CA, whose interests are related to this work; Levi is a member of the Scientific Advisory Board of NovaSight; Morris is on the scientific advisory boards of Neurotrack and of the AARP Global Council on Brain Health; Nahum is a paid consultant for Posit Science; Panizzutti is the founder of NeuroForma LTDA, a company with a financial interest in computerized cognitive training; Seitz is a founder and stakeholder in Carrot Neurotechnology, a company that sells a vision brain game called ULTIMEYES. The other authors declare that they have no conflict of interest. Acosta, A., Adams, R.B., Jr., Albohn, D.N., Allard, E.S., Beek, T., Benning, S. D., … Zwaan, R. A. (2016). Registered replication report: Strack, Martin, & Stepper (1988). Perspectives on Psychological Science, 11(6), 917–928. doi: https://doi.org/10.1177/1745691616674458. Anguera, J.A., Boccanfuso, J., Rintoul, J.L., Al-Hashimi, O., Faraji, F., Janowich, J., … Gazzaley, A. (2013). Video game training enhances cognitive control in older adults. Nature, 501(7465), 97–101. doi: https://doi.org/10.1038/nature12486. Baniqued, P., Allen, C.M., Kranz, M.B., Johnson, K., Sipolins, A., Dickens, C., …, Kramer, A.F. (2015). Working memory, reasoning, and task switching training: transfer effects, limitations, and great expectations?. PLoS One. doi: https://doi.org/10.1371/journal.pone.0142169. Beaumont, J. L., Havlik, R., Cook, K. F., Hays, R. D., Wallner-Allen, K., Korper, S. P., …, Gershon, R. (2013). Norming plans for the NIH toolbox. Neurology, 80(11 Suppl 3), S87–92. doi: https://doi.org/10.1212/WNL.0b013e3182872e70. Diao, D., Wright, J. M., Cundiff, D. K., & Gueyffier, F. (2012). Pharmacotherapy for mild hypertension. Cochrane Database of Systematic Reviews(8). doi: https://doi.org/10.1002/14651858.CD006742.pub2. Health, N. I. o. (2014). Notice of Revised NIH Definition of “Clinical Trial”. (NOT-OD-15-015). Retrieved from https://grants.nih.gov/grants/guide/notice-files/NOT-OD-15-015.html. Accessed 1 Nov 2018. Hendershot, T., Pan, H., Haines, J., Harlan, W. R., Marazita, M. L., McCarty, C. A., …, Hamilton, C. M.. (2015). Using the PhenX toolkit to add standard measures to a study. Curr Protoc Hum Genet, 86, 1 21 21–17. https://doi.org/10.1002/0471142905.hg0121s86. Howard, J. (2016). Do brain-training exercises really work? CNN. Retrieved from https://www.cnn.com/2016/10/20/health/brain-training-exercises/index.html. Accessed 1 Nov 2018. Nosek, B. A., Ebersole, C. R., DeHaven, A. C., & Mellor, D. T. (2017). The preregistration revolution. OSF Preprints. doi: https://doi.org/10.17605/OSF.IO/2DXU5. Pek, J., & Flora, D. B. (2017). Reporting effect sizes in original psychological research: a discussion and tutorial. Psychological Methods. doi: https://doi.org/10.1037/met0000126. Rebok, G. W., Ball, K., Guey, L. T., Jones, R. N., Kim, H. Y., King, J. W., … Group, A. S. (2014). Ten-year effects of the advanced cognitive training for independent and vital elderly cognitive training trial on cognition and everyday functioning in older adults. Journal of the American Geriatrics Society, 62(1), 16–24. doi: https://doi.org/10.1111/jgs.12607. Roberts, G., Quach, J., Spencer-Smith, M., Anderson, P. J., Gathercole, S., Gold, L., … Wake, M. (2016). Academic outcomes 2 years after working memory training for children with low working memory: a randomized clinical trial. JAMA Pediatrics, 170(5), e154568. doi: https://doi.org/10.1001/jamapediatrics.2015.4568. Rothbaum, B. O., Price, M., Jovanovic, T., Norrholm, S. D., Gerardi, M., Dunlop, B., … Ressler, K. J. (2014). A randomized, double-blind evaluation of D-cycloserine or alprazolam combined with virtual reality exposure therapy for posttraumatic stress disorder in Iraq and Afghanistan War veterans. The American Journal of Psychiatry, 171(6), 640–648. doi: https://doi.org/10.1176/appi.ajp.2014.13121625. Stierlin, A. S., Herder, K., Helmbrecht, M. J., Prinz, S., Walendzik, J., Holzmann, M., … Kilian, R. (2014). Effectiveness and efficiency of integrated mental health care programmes in Germany: study protocol of an observational controlled trial. BMC Psychiatry, 14, 163. doi: https://doi.org/10.1186/1471-244X-14-163. Tsai, N., Buschkuehl, M., Kamarsu, S., Shah, P., Jonides, J., & Jaeggi, S. M. (2018). (Un)Great expectations: the role of placebo effects in cognitive training. Journal of Applied Research in Memory and Cognition, 7(4), 564–573. https://doi.org/10.1016/j.jarmac.2018.06.001. Valdes, E.G., Andel, R., Lister, J.J., Gamaldo, A., & Edwards, J.D. (2017). 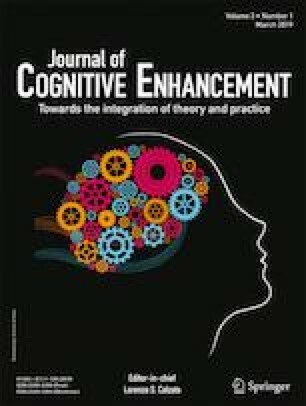 Can cognitive speed of processing training improve everyday functioning among older adults with psychometrically defined mild cognitive impairment? Journal of Aging and Health, 898264317738828. https://doi.org/10.1177/0898264317738828. Voss, M.W., Prakash, R.S., Erickson, K.I., Basak, C., Chaddock, L., Kim, J. S., … Kramer, A. F. (2010). Plasticity of brain networks in a randomized intervention trial of exercise training in older adults. Frontiers in Aging Neuroscience, 2. https://doi.org/10.3389/fnagi.2010.00032. Walton, A.G. (2016). Do brain training games work, or is it the placebo effect? Forbes.com. Retrieved from https://www.forbes.com/sites/alicegwalton/2016/06/21/does-brain-training-work-or-is-it-all-placebo/#3b654dc67497. Accessed 1 Nov 2018. Weintraub, S., Dikmen, S.S., Heaton, R.K., Tulsky, D.S., Zelazo, P.D., Bauer, P.J., … Gershon, R.C. (2013). Cognition assessment using the NIH toolbox. Neurology, 80(11 Suppl 3), S54–64. https://doi.org/10.1212/WNL.0b013e3182872ded. Wexler, B.E., Iseli, M., Leon, S., Zaggle, W., Rush, C., Goodman, A., … Bo, E. (2016). Cognitive priming and cognitive training: immediate and far transfer to academic skills in children. Scientific Reports, 6, 32859. doi: https://doi.org/10.1038/srep32859. Zhao, W., Hill, M.D., & Palesch, Y. (2012). Minimal sufficient balance—a new strategy to balance baseline covariates and preserve randomness of treatment allocation. Statistical Methods in Medical Research https://doi.org/10.1177/0962280212436447. Zwaan, R.A., Etz, A., Lucas, R.E., & Donnellan, M. B. (2017). Making replication mainstream. The Behavioral and Brain Sciences, 1–50. https://doi.org/10.1017/S0140525X17001972.